The banking industry touts that they want to meet the individual needs of consumers. But how well are banks and credit unions achieving the holy grail of omnichannel personalization and contextual engagement? Most financial institutions are working to change a legacy of depersonalized service, leveraging the considerable technological sophistication and vast data resources at their disposal to give consumers the customized guidance and services they desire. The goal is to replicate the level of personalization found in other industries such as retail, travel and hospitality, making engagements more seamless and offering solutions that are both real-time and contextual. 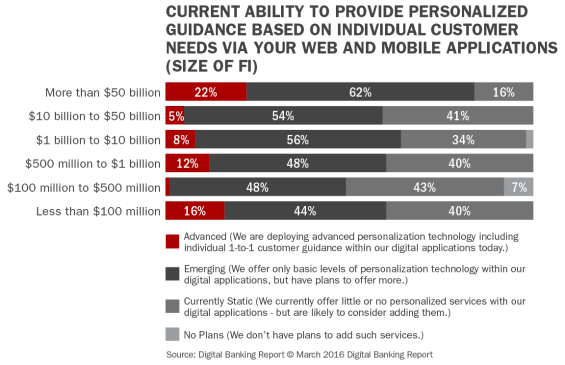 Unfortunately, while financial institutions know what they want to achieve, they are still falling significantly short of their objective according to “The Power of Personalization in Banking,” published by the Digital Banking Report and sponsored by Personetics. In fact, there are still many instances where the basics of personalized delivery of financial services are not being met. The importance of knowing a customer’s personal financial situation. The importance and ability to provide real-time personalized guidance. Current use of personalized contextual alerts and notifications. Prioritization of alternative digital strategies. The importance of leveraging consumer insight and data is more important than ever. New tools and technologies make advanced analytics available for all sized organizations, while digital channels and the desire for personalized offers make the investment in data analytics mandatory for success. Unfortunately, while the need to use advanced analytics for insight-driven marketing is one of the most important trends in marketing, it still ranks very low on priorities according to our 2016 State of Financial Marketing report. This is the dilemma facing the banking industry … know the problem, but not solving the problem. According to the research from “The Power of Personalization in Banking,”, there was general consistency across all institution types and asset ranges when financial institutions were asked about the importance of knowing their customers’ and members’ personal financial situation. Only 12% – 20% of organizations surveyed didn’t think it was either ‘very’ or ‘extremely’ important to know their customers. The importance of knowing the current financial situation of consumers is aligned with what consumers believe should be known about them according to the study. Unfortunately, consumers made it very clear that they don’t believe their primary financial institution really knows the important components of their financial life. An increasing percentage of consumers want their financial institution to be a seamless part of their daily life, expecting everything to happen on their terms. This means communicating with the consumer at the right time, right place, right channel and on the appropriate device. They want their primary financial institution to know them, look out for them and reward them. Banking customers primarily use mobile banking to review transactions, process deposits, make transfers and handle everyday banking needs. Most of the mobile investment from the bank has been for the real-time accessibility of transactional data. Consumer expectations are much higher than this according to the study. As a result, banks and credit unions must not only understand their customer, but be able to deliver insights and guidance in real time. As with the question regarding the importance of knowing consumer’s financial lives, there was consistency across the board when institutions were asked about the importance of providing real-time, customized guidance. 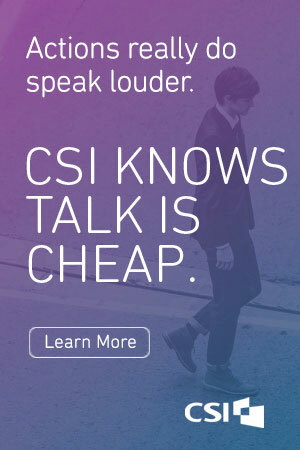 Despite the consistency, the level of importance was at least 10% less than ‘knowing the customer’. It’s one thing to know what the consumer wants and what should be done to provide a differentiated and contextual consumer experience. It is far different to be able to deliver on the ‘personalization promise’. The research asked a series of questions around the ability to provide contextual insights and the solutions that illustrate that organizations are looking out for their consumer. A key component of this deliverable is the ability to provide these insights in real time through digital channels. To assess the ‘personalization maturity’ of financial institutions, we had the responding organizations rate themselves as ‘Advanced’, ‘Emerging’, ‘Static’ or having ‘No Plans’ to provide contextual, personalized insights and solutions to consumers. As would be expected, the largest financial institutions had the highest self assessment around the ability to provide real-time contextual guidance. That said, only 17% of the large national and regional banks considered themselves advanced in this capability. Interestingly, when we look at the breakout by size, we see that organizations over $50 billion in assets and those of less than $100 million were the most advanced. It is encouraging that roughly 50% of each type of organization in almost all asset ranges considered themselves as ‘Emerging’ when asked about the ability to deliver personalized guidance digitally. 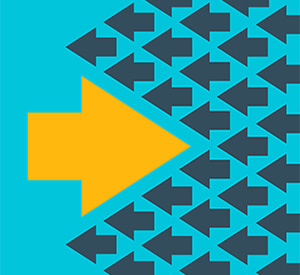 The unasked question is the timeline around moving from an ‘Emerging’ level to being ‘Advanced’ in leveraging consumer insights to deliver a personalized experience. Of grave concern is that roughly 40% of all but the very largest financial institutions place themselves in the ‘Static’ self assessment category. When we asked survey respondents to give a priority for alternative digital strategies, the responses were in alignment with previous surveys done by the Digital Banking Report. By a fairly wide margin, financial services organizations are placing a higher priority on “improving consumer trust, loyalty and engagement” and “using digital channels for effective cross-selling of products and services” than for “lowering costs”. We found almost universal uniformity that roughly 40% of the responders believed that the effective cross-selling of products and services was the top priority. Organizations in the asset range of $10B to $50B deviated from this norm by placing a much higher priority (46%) on loyalty and engagement vs. prioritizing cross-selling (29%). These results reinforce the primary benefits of a strong personalization and contextual engagement strategy. Since customer insight is best used for better timed and targeted offers and for more custom communication, the development of a better personalization strategy supports the top priorities of financial institutions today. In fact, it could be argued that these strategies are required for survival in a marketplace that is becoming more competitive and where consumers are more demanding. Expectations for great digital experiences come from Uber, Best Buy, Amazon as well as other retail, travel and hospitality leaders. These organizations have incorporated business transformation to offer the same experience across channels and devices. They focus on the customer experience to effectively pull in the relevant points of big data to truly demonstrate they are looking out for the consumer’s specific best interests. The successful financial services institutions in the future (legacy banking organizations or fintech start-ups) will differentiate themselves by the ability to deliver on the ‘personalization promise’ and be in the best position to integrate solutions with a consumer’s daily life. The The Power of Personalization in Banking report, sponsored by Personetics, provides unprecedented insight into the minds of consumers and the activities of financial institutions around personalization and contextual engagement. The report includes the results of a survey or 1,000 consumers as well as a survey of more than 300 financial services organizations. The report includes 64 pages of analysis and 60 charts. 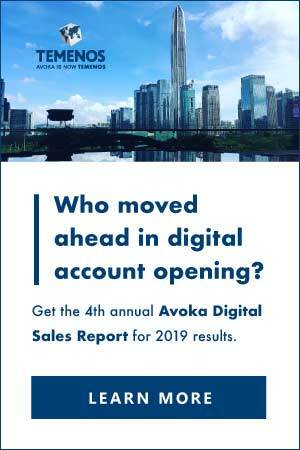 You can download an executive summary of this Digital Banking Report by clicking here. Subscribers to The Digital Banking Report and those wishing to purchase the complete report can access it immediately by clicking here. This article was originally published on March 29, 2016 . All content © 2019 by The Financial Brand and may not be reproduced by any means without permission.